The thirteen new Safflower colors feature a light blue ‘SF’ as a watermark on their label to clearly distinguish them as colors made with a different binder. The evidence was undeniable as our eyes swung slowly across the drawdowns that spread out before us. The handful of initial colors ground in every possible combination of oil all pointed to a similar conclusion: there was something here that simply could not be ignored. The clarity of the colors was exceptional and in some cases, the difference in the results was almost shocking. But there was also caution. As enticing as the results were, they represented just a beginning, a first tentative evaluation. The bulk of the research and trials still lay ahead. Those initial thoughts took shape over two years ago, and only now can we finally share that spark of excitement and offer the fruit of all the endless testing: a selection of thirteen Williamsburg Handmade Oil Colors ground in expeller pressed, refined safflower oil. We will go through some of the research and address many of the questions about safflower and its possible role on a painter’s palette, but in the end here is what matters most: it allows certain colors to hold onto a luminosity that would otherwise be lost. It helps preserve a blush of azure blue as it spreads across the sky, the final crisp flickerings of white, the translucent violet held within a skin of glaze, or the palest notes of gossamer greys and cool green earths. Each of these are moments of nuance, gauged and held in balance until “just so”. Without those reasons, there would be little cause to give safflower or any other alternative oils a second glance. The first twelve colors we chose for the new line were ones that would clearly gain by being made in a less yellowing version, while the thirteenth is a unique color we are offering for the first time. Each of these will have a light blue ‘SF’ displayed as a watermark on its label to clearly show that it is made with a different binder, and will use ‘SF’ as a prefix in front of their name when being referenced in color charts, price lists, and on the website. Below we touch on each group separately. The well-known, essential whites that almost every painter relies on. The use of safflower will assure that passages and tints made with these will retain their clarity with little if any noticeable color shifts. Porcelain White is based on a new pigment for Williamsburg, PW 5, a complex co-precipitate of barium sulfate and zinc sulfide more commonly known as Lithopone. Created in the 1870s and for a while a rival to both lead and zinc, it captured some 60% of the market for white pigments in 1928 before declining to 15% by 1945 in the face of a growing dominance by titanium dioxide (Alphen 1998). It holds a renewed interest for us as an alternative to Zinc White, which forms a brittle film and has been linked to issues of cracking and potential delamination when used extensively. Historically known as Enamel, Orr’s, or Charleston White, we chose the one we felt was the most descriptive: Porcelain White. Of all the colors impacted by the yellowing of linseed oil, translucent and delicate blues are some of the hardest hit. Traditionally these blues are among the colors most frequently mentioned for grinding in alternative oil. The impact of the yellowing is seen most when creating light tints or in glazes. Using the new safflower versions of these blues should provide more stability and glow in this important area. These transparent violets are particularly sensitive to any color shifts when used alone or in glazes. With age, or after prolonged storage in the dark, the linseed version of Ultramarine Violet can take on a grayish pallor, while the similar Ultramarine Pink and the prismatically pure Cobalt Violet Light develop a muted orangish patina. The new safflower versions should preserve the beauty of these subtle tones. Unlike other transparent earths with a strong warmish cast to them, such as our Italian and Brown Pinks, these two colors are extremely weak tinters and more impacted by any hint of a yellow cast that might develop. It should be stressed that none of these colors will replace the current linseed-based versions. Williamsburg has always believed that linseed provided the strongest and most durable film possible, despite its tendency to yellow – and we still do. That core commitment remains and will continue intact. In addition, both materials and conservation science have amassed a solid body of evidence justifying linseed’s central role. There is simply no way around that. However, it is also important to acknowledge that other oils appear quite frequently throughout the historical record and play important parts. In particular, both poppy and walnut have long traditions associated with them, and were constantly sought out by artists wanting to find a less yellowing alternative for their whites, blues, and pale tints. There are even brief periods and regions when one or the other enjoyed broad popularity. Starting about 75 years ago, safflower slowly began to emerge as an addition to the list, and eventually became the most common alternative to linseed, especially for whites. When we began this study in 2011 it was natural to include all three of these oils in the initial trials. However, both poppy and walnut were dropped fairly early on as not representing strong directions to move in: walnut because it did not show enough of an improvement in terms of yellowing, while poppy created softer, less durable films. Because of that, the vast majority of the work quickly focused on optimizing our use and deepening our understanding of safflower oil. Table 1 – Fatty Acid profiles of drying oils. Data from Mills, White, 2003; Serpico, White, 200; Baily’s Industrial Oil and Fat Products, 6th ed. To understand safflower and how it differs from other oils, we need to pull back a touch and take a look at drying oils in general. All natural oils are composed of triglycerides (Fig. A), a combination of three fatty acids attached to a glycerin backbone. It is those fatty acids that we are most concerned about because which ones are attached, and in what proportion, is what decides if a particular oil is suitable for making paint, how much it will yellow, its durability, and even when and how you use it in your painting. For an oil to function as a binder it needs to be classified as a drying oil, meaning that if spread in a thin layer it will eventually form a film. This happens through a highly complex process called autoxidation, where oxygen is absorbed from the air, forms unstable compounds called hydroperoxides that decompose and trigger the creation of cross-links with other fatty acid chains. As this process continues, a dense, tangled network of linkages is created, causing the oil to continuously thicken until it forms a rubbery solid. This ability to react with oxygen is only found in unsaturated fatty acids, which are ones that have a number of reactive sites called double bonds (Fig. A). The more double bonds, the more oxygen they can react with, and the more potential locations for creating links to other chains. Fatty acids with just one double bond are monounsat-urated, while those with two or more are called polyunsaturated. These are the same terms found in the descriptions of everyday cooking oils and margarines, so they might already sound familiar. The unsaturated fatty acids that make up the largest component of drying oils include oleic, with one double bond, linoleic with two, and linolenic with three. While all of these are usually reported when describing a drying oil, it is really just the linoleic and linolenic acids that play any true role in the drying process. There are two other terms one will frequently come across in discussions of drying oils: Iodine Value and Drying Index. Both are simply ways to measure the reactivity of an oil, which in turn provides a rough assessment of how fast it will dry and how durable it will be. Iodine Value is a basic test where one measures how much iodine is absorbed by the available double bonds in a known volume of the oil. The higher the number, the more double bonds are present. The Drying Index is an equally simple calculation where one adds the percentage of linoleic acid to twice the percentage of linolenic acid. It can be helpful to pause here and move away from the purer chemical descriptions for a moment and form a looser visual analogy of the process. Essentially the fluid and free flowing fatty acids are being braided and knitted into a three-dimensional mesh. In place of the long linkages of carbon and hydrogen that make up a fatty acid, think strands of metal chains or segments of ropes, with the restriction that some can only be tied or linked to others in one, two, or three places. As one can imagine, the more spots where you can hook them together, the tighter and stronger the mesh becomes, and the better it can hold together as inevitably links and layers begin to fray and break over time. How tight or loose the network becomes will also decide how porous the structure is – how easily the outside air can make its way in, and just as importantly, how easily the many small, volatile materials that start off trapped in the tangle of strands can eventually make their way up and out. It can be helpful to compare the fatty acid profiles of the major drying oils, correlating those percentages with what we know about their speed of drying, tendency to yellow, and ability to produce durable films. In Table 1, as you move from poppy on the far right, through safflower, walnut and finally linseed, the films are get stronger, drying faster, have higher Drying Index and Iodine Values, and â€“ the inevitable trade-off in all this â€“ getting progressively and unavoidably yellower. It is also no coincidence that as you move along in this direction, the percentage of Linolenic Acid increases and Linoleic gets less. Oleic Acid only plays a very peripheral role in terms of oxidative cross-linking, so its impact on film formation and yellowing is much more negligible. If the only thing that mattered about drying oils was just how durable or flexible their films were, there would be little need or even much temptation to look beyond linseed oil. But yellowing has always been something painters have acknowledged, worried about, and looked for ways to minimize. Part of that search has been exploring ways to extract and process linseed that might reduce its yellowing: from sun bleached to water washed, from cold pressed to alkali refined, and any number of other methods for further filtering and purifying. However, while some differences can result from these, the range is narrow at best. Indeed, in several studies it has been shown that highly purified, laboratory forms of linolenic acid (methyl linolenate and trilinolenin) yellowed considerably (Rakoff, 1976, Privett, 1961), so even with improvements elsewhere, there is a core degree of yellowing that appears intrinsic to drying oils having appreciable percentages of linolenic acid. Because of that, the only viable way past the yellowing issue is to look beyond linseed as the primary binder. From the start, Safflower’s singular claim to fame as a drying oil was its ability to resist yellowing and produce cleaner, brighter whites, along with some blues and other translucent tones. To get a sense of comparative yellowing we cast drawdowns and allowed them to age in the ambient light of the laboratories, as well as covering half of each sample so it could undergo ‘dark aging’. As odd as it might seem, given the amount of concern that yellowing generates, the exact mechanism that causes it to happen is still very much debated and a topic of research. The majority of theories link it to chromophores created as by-products of oxidation, which would certainly explain its correlation with higher levels of linolenic acid, while some investigators have pointed to possible impurities or environmental conditions as at least contributing factors. What seems irrefutable is that whatever the process happens to be, it is much more strongly tied to linseed-based paints than to safflower ones. Chart 1 – Drying curves for 10 mil drawdowns of titanium dioxide in safflower, cold pressed linseed and refined linseed oils. Weight gain is for the oil only. Drytime is never as straightforward as one would hope, especially when oils exhibit such a long period between feeling ‘touch dry’ and being ‘fully cured’. To make matters worse, oil films remain dynamic, undergoing chemical processes that continually transform and degrade the paint throughout its life. Indeed, there is never a substantial period of time when the paint remains stable and relatively inert. Add in the complexity introduced by different pigments, additives, or simply the environment, and one is quickly limited to fairly broad generalizations. One way to study the drying of various oils is to look at the changes in weight as the paint absorbs oxygen, increases in density, and then begins a slow descent brought on by the loss of volatile materials. 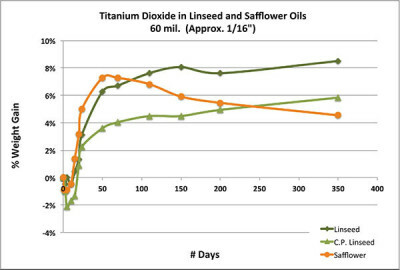 In the first graph (Chart 1) we show the weight gained by simply the oil in three fairly thin films of titanium dioxide ground in safflower, cold-pressed linseed, and alkali refined linseed. As can be seen, the paint made with refined linseed peaked and felt touch dry in the 4-5 day range, while both the safflower and cold-pressed versions did not reach this level until the 8-10 day range. While this extended period is common for safflower, it is somewhat surprising that the cold-pressed linseed took just as long. Most likely this points to the presence of natural antioxidants found in minimally processed oils, which are known to inhibit the curing process. It also illustrates one of the complications when trying to predict dry times purely on the basis of fatty acid profiles as these other components can be glossed over. Also, it is worth noting that while the two linseed oils appear to be leveling off and stabilizing, the safflower has already started to lose weight quite rapidly from the loss of volatile components escaping through its looser, more open crosslinking. Chart 2 – Drying curves for 1/16″ disks of titanium dioxide in safflower, cold pressed linseed and refined linseed oils. Weight gain is for the oil only. Chart 2 looks at the same paints, but now cast in much thicker 1/16″ disks and followed over the course of a year. The first impression again presents us with something of a quandary. Based on this graph, safflower clearly appears to be the more reactive oil, gaining the greatest amount of weight at the fastest pace for the first couple of months, and only then starting to decline in mass while the two linseed oils continue their slower, more plodding march upwards. This relates to a dynamic that was noted very early on in commercial studies looking at the drying rates of safflower vs. linseed. Because linseed is much more reactive, it tends to form a tighter skin relatively quickly. While in very thin films this has little impact, in thicker ones the skin acts as a diffusion barrier slowing down the absorption of oxygen into the underlying paint. Safflower, on the other hand, stays wet on the surface for a longer period, allowing oxygen to continue to propagate more freely into the interior of the paint. Even after safflower forms an initial skin, it is much more porous and presents far less of an obstacle to oxygen. But that same permeability works in both directions, allowing volatiles to easily escape and causing the rapid decline in weight later on. So, while safflower might exhibit better through drying in some situations, any initial gains in density is quickly lost. Conversely, heavily applied linseed-based paints can often hide softer, uncured layers beneath a skin that might feel dry to the touch. As we will see in the next section, it is ultimately these swings in density and loss of mass and volume that are the main issues surrounding safflower. The most common concern about the use of safflower, or indeed any of the alternative oils, is that they form weaker, more brittle films, and so carry a greater risk of cracking later on. These issues are ultimately related to how porous and flexible the paint is, and how much it changes in volume and density over time. And as we will see, all of these areas are tightly interwoven. The main vulnerability of safflower is caused by its inability to create a dense network of cross-links; it simply lacks the degree of unsaturated double bonds that would be required. As a result its surface is more porous and volatile components can easily leave the film. Many of these mobile materials, which include both unreacted free fatty acids and smaller components created by internal processes or from hydrolysis, act as plasticizers that ultimately help a film remain flexible. As these are lost through evaporation and solvent extraction, the film becomes increasingly thin and more rigid. Chart 3 – Data adapted and simplified from Tumosa, Mecklenberg 2013. This process can be seen quite dramatically in Chart 3, adapted from research done at the Smithsonian Institute (Tumosa 2013) and showing the drying curves of various oils tracked for over three years. What is most striking is the fact that every one, with the exception of linseed, ends up losing more weight than what they had at the start. It is also instructive to note exactly when each oil dips below the base line, the final amount of weight lost, and the ordering of the oils from the lowest on up. As one can see, these three things all correlate nicely to the relative amount of saturation that each oil has. The implication is that linseed, with its high levels of linolenic acid, is able to retain its uptick in density while holding onto the free fatty acids and other materials that can act as plasticizers. All the other oils will unfortunately, and inevitably, go on to form thinner, less flexible films. While safflower narrowly does better than the other alternatives, one still needs to approach its use with a good deal of caution. When can these be used? Moderation is the key here. Safflower oil will not create the same type of robust durable film as linseed, and we do not recommend using them for underpaintings or thick passages of impasto. They should also not be used for a ground. Use them when the benefit of their clarity is most valuable – in the upper areas and when glazing towards the end of a painting. It is also considered safe to use in alla prima techniques where the painting is developed in a single sitting as one continuous wet-in-wet layer, without any of the structural complications that come with the more traditional approach of layering. We also recommend, as we do with all oil paintings, to paint on an inflexible support whenever possible or to consider mounting the canvas to a panel once it is finished. Everything we know points to this as the number one thing anyone can do to minimize risks of cracking. How much slower drying are they? By itself safflower is considered a fairly slow drying oil so you might find that some adjustment is needed. However, drying is also a complicated issue, especially when you add in the impact of pigments, driers, mediums, and the environment. That said, thin layers of the safflower colors will likely take just 2-3 days longer than their linseed-based versions. Just keep in mind that being touch dry does not mean the paint is no longer going through dynamic changes. If layering on top, provide additional time for the film to cure more completely. Can I mix them with my other paints? Yes, absolutely. In the process, you will be creating layers that have properties in-between the two. Not a bad thing, just something to be aware of. What Mediums can I use with them? All the same mediums one uses with regular linseed-based paints can be used with these. Using mediums based on Stand Oil will increase durability while preserving the resistance to yellowing, although it will not speed up drying.